It’s October, the month when grown men do crazy things like this. This vintage photo, most likely from the 1960’s, is from my collection. 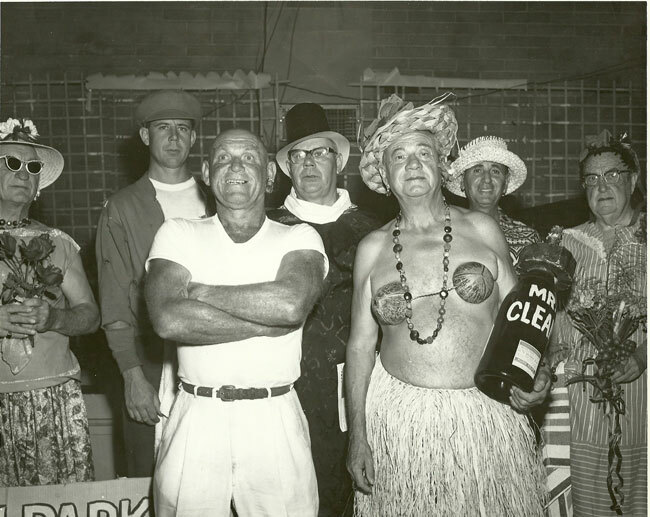 It’s hard to say why these men are in costume, but let’s assume it’s a Halloween party at the local American Legion or men’s club. The guy who’s supposed to be Mr. Clean REALLY looks like Mr. Clean. My favorite is the “house frau” on the right. Note that the youngest guy has the lamest costume. One of the best parts of getting older is not caring what others think. By that measure, I’ll bet the man in the coconut bra is the oldest! Get your costume on. Halloween is coming! This entry was posted in 1960's, Advertising, Americana, Carol, Costumes, Halloween, Humor, Photography. Bookmark the permalink.